Independent file photo SMSU’s Ben Emrich sizes up his opponent during their meet against Upper Iowa University on Jan. 18. The Mustangs will close out the regular season this weekend against the University of Mary and Minot State University. MARSHALL – The Southwest Minnesota State wrestling team (1-6, 1-5 NSIC) closes the regular conference season on a road trip to Minot State (3-9, 1-5 NSIC) on Saturday at 2 p.m. and UMary (4-4, 2-4 NSIC) on Sunday at 2 p.m.
SMSU won its first dual of the season with a 24-16 win over MSU Moorhead last Friday night in the PE Gym. SMSU won six of the ten bouts and even forfeited at 125. Arredondo moved up to No. 7 in the latest NWCA poll released on Monday. UMary is 4-4 overall and 2-4 in the conference and was ranked No. 20 in the latest NWCA poll released on Monday. 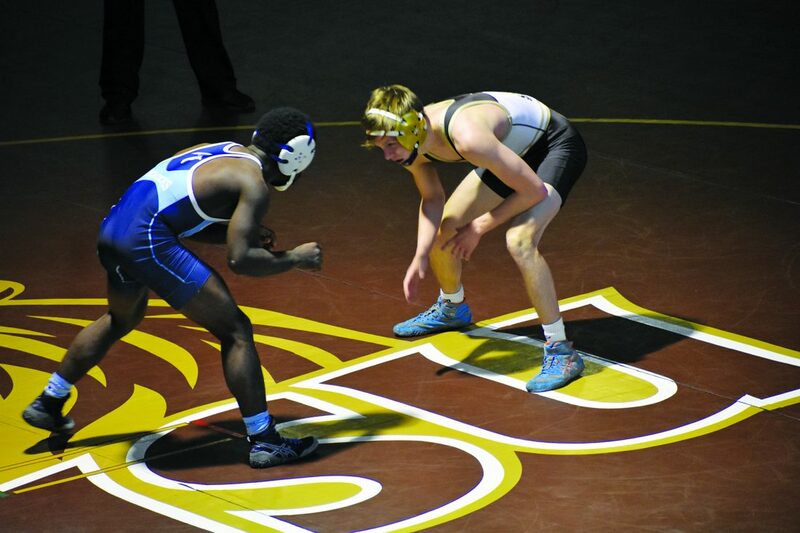 Two Marauders were ranked in the top-12, with Tate Barnhardt (133) ranked No. 3 and Phillip Springsteen (174) ranked No. 8. Barnhart is 8-0 this season and went 2-0 last weekend against other nationally-ranked opponents. Springsteen is a redshirt sophomore with a 10-2 record against DII opponents. Minot State is 4-9 overall and 1-5 in the conference, ranking just one spot above SMSU. Minot State earned their first conference victory last Friday with a 25-20 upset victory over No. 25 Northern State. Minot State picked up a 33-12 non-conference victory against Dickinson State on Wednesday night. SMSU leads the all-time series 9-3 dating back to the 2006-07 season. SMSU has won four of the last five duals but dropped the meeting last season, 20-19. SMSU is 5-1 in Bismarck. SMSU leads the all-time series 7-1 and has won the last six duals. The series started in the 1970-71 season and played for two consecutive years until starting again in the 2012-13 season. SMSU won the meeting last season 23-17 and is 4-1 at Minot. Following the final regular season weekend, the NCAA Super Regional will take place on Saturday, Feb. 23 at 10 a.m. in Moorhead, in Alex Nemzek Hall.